Our community is wide, embracing a diversity of people and organizations. Contributions come in many ways – important and obvious ones like fundraising and event organization, but also talents such as painting, maintenance, facility planning, design, copywriting, publicity, marketing outreach, photography, and legal expertise. You have something we can use. Everyone has skills that can make an impact on our mission of delivering Heartfelt Healthcare for underserved children. We welcome your contribution! For more information on volunteer opportunities, please call 708.848.0528, email info@childrenscliniciws.org or complete the online form. When five-year-old Bryan came in for his first visit, he was so scared to see the dentist that he started crying the moment he arrived. To calm him down, Dr. Lynse Briney play-acted the procedure on a stuffed dinosaur. Following this “play,” Bryan was able to calm down and had four cavities filled that day. Dr. Briney also counseled his mom on better brushing and nutrition habits. 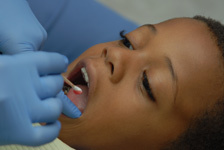 She hopes Bryan will return for his six-month check-up without any new cavities.